Want to have us clean your windshield and check your oil, too? 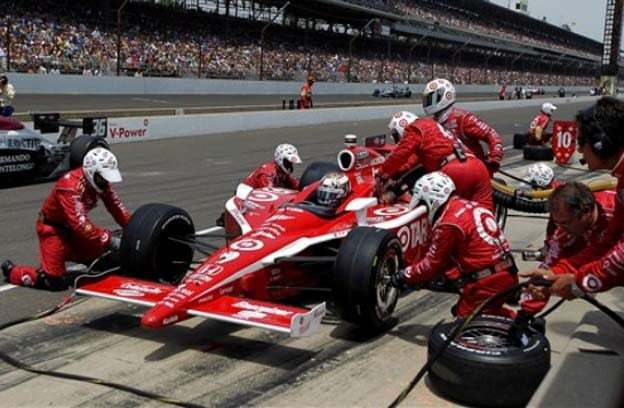 Dario Franchitti pits at the 2011 Indy 500. The Tarjay folk were not the only team with blips in their fuel strategy – there was splashing and dashing going on in the pits as the end neared. For instance Danica, leading for ten laps, dropped to 10th after a needed fuel stop. A yellow might have made a difference. But in qualifying both Target cars ran out of fuel. Hello! A teaching moment here? Suggestion: replace some computers or the ones paying attention to them. There’s a mis-connect here. It all set me to musing about the inherent risks in mixing digital information with analog actions. All that telemetry, all that detailed information, all that inputting of expansion coefficient, of temperature variations, of of of. Then cut to what some guy pours into the car. That’s the most likely place to err, I think, at the input point. The accuracy of the amount to go in and the precision in getting it all in. After the race Dario let his staggering disappointment stand for any criticism of either strategy or execution. “I don’t want to second–guess anyone,” he said. Scott was not so circumspect and used the word “stupid.” But the confounding fuel mistakes make me think of A.J. Foyt’s explanation for an Indy loss of his that should have been another victory for him. “We just out-engineered ourselves,” he said. I’m reminded of a pit stop of mine in a Porsche 550 at Venezuela in 1958. There’s a photo of it; two guys with a huge can trying to hit the filler right behind my head. With every other glug-glug a surge sent gas washing across the deck of the car. Or chillingly down the back of my neck (chilling until it started stinging that is.) Maybe they got more than half of what was in the can into the tank, but who’s counting? Never ran out of fuel. Today, that incredible technology based on the utter exactitude of marching numbers and minute calculations is only as clever as the stiffs using it. Not to be a Luddite but I think a lot of what’s amiss in this world is us out-engineering ourselves. Need another fix of McBlog? Want to check out Denise McCluggage’s classic motor sports pics and more? Click on the logo! This entry was posted on Friday, June 17th, 2011 at and is filed under Automobiles. You can follow any responses to this entry through the RSS 2.0 feed. Both comments and pings are currently closed.